Hi, how are you???! I know things have been really quiet here, but generally that means that things are bustling with everything else in my life. The biggest thing keeping me busy has been preparing for the upcoming Holiday Trunk Show at the workroom. It’s Sunday December 7th, noon – 5pm, which happens to only be 10 days away!!! From now until the show, I’ll be posting about all the wonderful vendors you can expect to see at the show. It’s a really great mix of people and I’m so excited to have them all together. 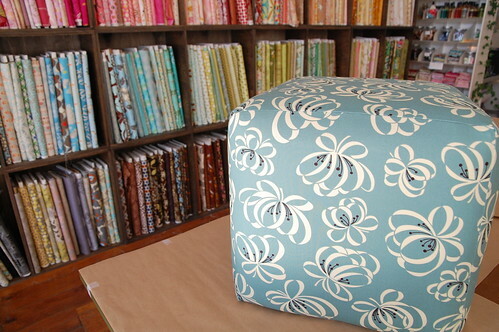 In other crafty news, I finally finished my upholstered cube. What a super fun class that was. I had the hardest time deciding on fabric. I put it off until the very last second and finally decided to go with the Porch Ribbon fabric from Denyse Schmidt’s County Fair line. I love it. I just need to head over to Lee Valley to pick up some legs. I really love the idea of making and upholstering your own furniture. How I would love to re-upholster my couch. This may be way too ambitious for my own good though. Nora and Kathryn made little presents for everyone in the class congratulating them on their finished cubes. I tried to hold off eating the sweet treat inside until I had actually finished my cube, but alas, my willpower is not that strong. I always feel a bit sad when classes like that end. In a way you wish they could just go on forever. But then there’s always something new to learn…like UNDERWEAR, in January. Man that class WAS so much fun! Kathryn and Nora are pretty sweet ladies, their treat was really yummy. 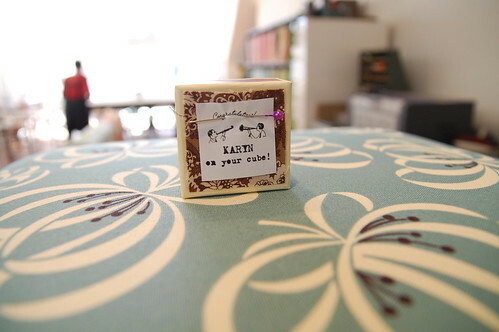 Karyn, your cube looks great, the fabric is nice and tight and the corners look very profesh. Picking a fabric is so tough! I decided not to put any legs on my cube because it is currently at the perfect height to put my feet up in my big red lounge chair. I did cover the bottom with a square of vinyl fabric for durability. Great fabric choice for the cube! Your classes look like so much fun (I have been spying the flickr pool) can’t wait to see the underwear piccies in Jan, I have never even considered it might be possible to make underwear – ha! angelune – sometime i really agonize over fabric choice. it seems so serious and permanent, especially with a piece of furniture. but really, now we know how to make slipcovers, so we can change the cube anytime we want! nice idea to put vinyl on the bottom for protection! That is one good lookin’ cube. And the craftswomanship is just outstanding. Pip, pip hooray for Karyn’s cube. The cube class was fantastic. Kate and I had a great deal of fun in that class, so much so that we signed up for two more classes. I think we are now confirmed addicts of the workroom. As for the sweet treats, we’re so glad you liked them. We thought that everyone was so great that we simply had to do something to show how awesome we thought eveyone was. It was our way of saying thanks for being brilliant. I’m bummed I missed this one. My apartment could use a few cubes! Can you recommend a book or some other resource for someone who’d really like to do this but lives to far away to take the class if you happened to run it again? I looked all the way through the flickr set and loved everyone’s cubes. I think something like that would be a great addition to our living room.